Overbites occur when the upper teeth overlap the lower teeth too much, which causes the lower jaw to be forced back towards the ears when the patient bites their teeth together. The jaw position with an overbite is a strained position that increases tension and stress in the head and neck regions. Many patients will clench and grind their teeth more often at night and sometimes during the day because they have an overbite. The position of their upper jaw and lower jaw are not aligned which is a malocclusion that causes a multitude of health and cosmetic problems. Health problems such as TMJ pain, neck and head pain, excessive tooth wear, stressed short lower faces and small looking chins are caused because the jaw is forced back towards the patient’s ears by the bite. Typically the patient’s chin is actually normal in size but it looks small because of the less than healthy jaw position established by the overbite. With true overbite correction, the facial profile is improved, the chin looks much larger and the patient feels better physically because the treatment is good for the patient’s health. Overbites contribute to headaches, jaw pain, tooth wear and neck pain because there is a great deal of stress on the jaw joints or TMJ due to the overbite forcing the lower jaw into an incompatible position with the bite. The jaw joints and the bite must be “in sync” to improve the health of the patient. The head and neck tension, TMJ pain, teeth wear and facial collapse resulting form an overbite has a negative effect on the patient’s physical health and mental well-being. Today, we are living longer than ever and we want to look and feel our best even if we are over 60 years of age. We look older and feel older because we never had the best possible jaw position that is in harmony with our jaw joints. Braces are a possible solution but braces, including Invisilign®, cannot improve the size or shapes of the teeth or make the teeth whiter. Orthodontics also takes a great deal of time and dental visits that many adults find unacceptable. Additionally, relapse is also a problem and you still may not have the chin position or facial profile that is possible with other treatments. Jaw surgery and braces are also potential solutions to overbite correction but the risks are considerable and most patients would rather not spend time in the hospital plus two or more years in braces. Healing can be unpredictable and relapse is another risk for this treatment method. The shapes, color and sizes of the teeth are not changed with this treatment. Jaw surgery is the treatment of choice when the jaw size difference is extreme. Porcelain veneers and Cosmetic Dentistry are used to improve the smile but they cannot improve the chin size, facial profile or correct an overbite. After getting porcelain veneers, patients will still have premature aging to their faces, small looking jawlines, short round faces typical of the older looking person, weak facial profiles, facial wrinkles, headaches and an overbite that is usually worse. Just getting the smile improved will not improve the shape of the face and cosmetic dentistry does usually does not improve the physical health of the patient. 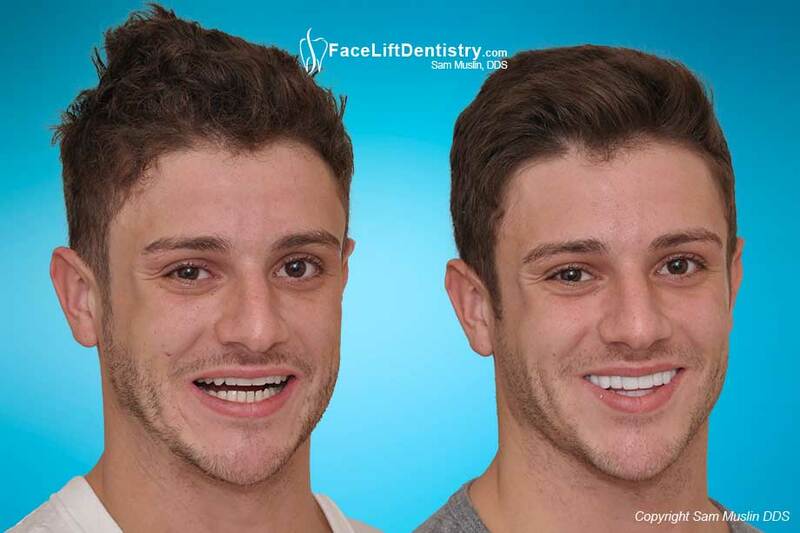 Face Lift Dentistry® is a trademarked method (patent pending) that is completely non-invasive with the specific goal of optimizing the patient’s chin size, facial profile, tooth color, bite, jaw position and tooth size, by non-invasively correcting overbites, under bites and bad bites using the “no tooth grinding” Venlay® Restorations. This method saves the healthy tooth structure, which makes the treatment much easier for everyone. All of the old veneers, crowns and fillings (if there are any) are replaced with a matching set of porcelain restorations for every tooth. No braces, no surgery, no facial fillers, no pain medication and no Botox® is utilized. This is the high tech dentistry treatment of the future that can be completed in as little as two to three weeks. It can resolve many of the physical, cosmetic and aging problems associated with overbites. Only one dentist at this time uses this method but he is planning his course to educate other dentists. While overbites usually are not considered serious, they place the patients with a life long physical compromise that can evolve into a handicap. Over time people with this dental problem develop some degree of physical compromise, says Santa Monica bite restoration expert Sam Muslin, DDS, MAGD. One young overbite patient was experiencing ongoing headaches. She hated her profile, too. She consulted with other medical professionals, but was not thrilled with the initial recommendations she was given. “I was told the only options for me were jaw surgery and braces, and that was just not going to work,” she said. 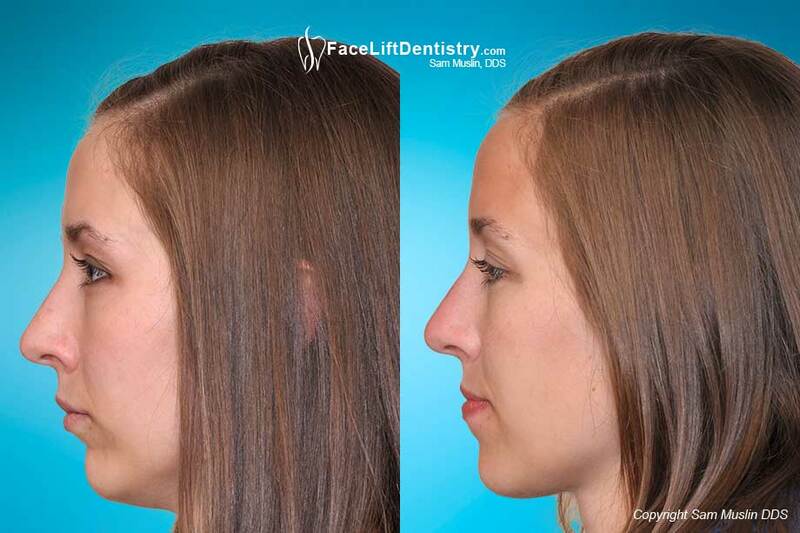 She wanted dental correction for her overbite without surgery or “metal mouth braces.” She heard about Dr. Muslin’s breakthrough Face Lift Dentistry® method and saw the fantastic results his other patients were getting. She made an appointment and liked what she heard during her consultation with him. “I came to Dr. Muslin pretty unhappy with my profile. I was having headaches and jaw problems and not only looking older but feeling older,” she explained. Dr. Muslin offered his breakthrough alternative to painful jaw surgery and long-term orthodontic visits. She took him up on his advice. Years later she is still grateful. Overbite Correction without Surgery: “I had VENLAY® Restorations put on each tooth on my lower jaw, and I’m just thrilled with the results,” she says. Each tooth is separate and she flosses, brushes and chews normally and looks years younger. The headaches, jaw problems and low self-esteem? An estimated 10 million people suffer from temporomandibular joint (TMJ) and muscle disorder, according to The National Institute of Dental and Craniofacial Research. The TMJ is the angular, hinging and sliding joint in the jaw near the ear. Pain in this area can interfere with sleep, eating, talking and work. By treating the source of the pain, Dr. Muslin improves physical health. “Once a biologically compatible jaw position is achieved, using my method, pain and tension disappear”, he explains. “Chewing improves, face shape is better, sleep is deeper, productivity at work goes up, no longer needing pain pills and the patients’ self-esteem soars”.